Chip-and-PIN vs. Chip-and-Signature: What's the Difference? Europay, MasterCard and Visa (EMV) chip-enabled credit cards are becoming increasingly popular throughout the U.S. And it's not difficult to see why. They come equipped with fraud-prevention features, making them very difficult to clone. In fact, it is because of these security features that EMV cards have already replaced traditional swipe-and-sign credit cards in most parts of the world. 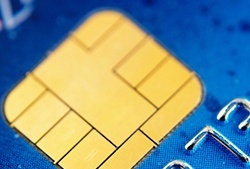 In the U.S., you'll usually see EMVs marketed as either chip-and-PIN or chip-and-signature credit cards. But how are they different (and which one is more secure)? Both types of cards come with fraud-prevention technology — embedded chips that assign unique IDs to each individual transaction. As mentioned before, these chips make cloning next to impossible. The credit card must be physically present when making in-store purchases. Both allow the shopper to insert his or her own card into the terminal — instead of having the cashier swipe the plastic on behalf of the customer (this may require some additional employee training). Both types of cards are readable by the majority of EMV machines, although some EMV terminals only accept chip-and-PIN cards. Both usually come with magnetic strips on the back — in addition to embedded chips on the front. However, these “magstripes” are slowly being phased out. Now let's look at the differences. With chip-and-signature credit cards, customers must sign their name on the receipt in order to complete the transaction. This step is identical to the swipe-and-sign process normally associated with older, magnetic credit cards. With chip-and-PIN credit cards, customers must key in a personal identification number (PIN) to authorize payment. Anyone can theoretically forge a signature, but without this unique code, the transaction cannot move forward. So while both types of credit cards offer added protection, the chip-and-PIN option is arguably more secure. After adopting chip-and-PIN credit cards back in 2004, the United Kingdom saw fraudulent losses plummet from $356 million a year to fewer than $100 million just four years later. Which Credit Card Type Should You Accept at Your Retail Store? In order to begin accepting EMV credit cards, your retail store will need an updated credit card reader. But because most EMV-enabled terminals can read both chip-and-PIN and chip-and-signature plastic, you don’t have to choose between one technology or another. This may change in the future. But for the vast majority of purchases, having one universal terminal should be sufficient. Just make sure that your staff members know how to process, return and cancel transactions made with all types of cards. To learn more about credit card processing at BluePay, click here. To contact our support team today, email us directly.